4 Bedroom Terraced House For Sale in Cheltenham for Guide Price £650,000. 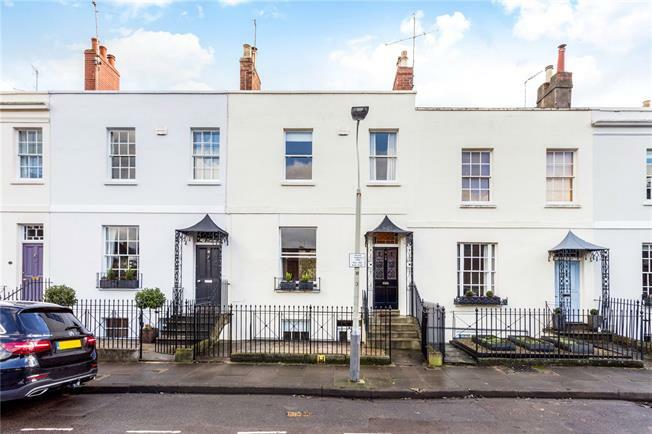 A pretty Grade II listed townhouse retaining many period features set in a residential road close to the town centre. The accommodation comprises a hall with floral cornice, stained glass door panels and overhead light, exposed floorboards and a lovely wrought iron canopy over the front door. The living room has a sash window to the front, built-in bookcases to one alcove, open fire with a trompe-d'oeil black marble fire surround, picture rail, ornate cornice, ceiling rose and double painted timber doors opening on parliament hinges to the rear sitting room with book shelving to both alcoves and large sash window to rear; cloakroom. Also on the ground floor is a guest bedroom with window to rear. On the lower ground floor is a study with stone flagged floor; dining room with fireplace, display cabinets with cupboards below to both alcoves, and sash window and door providing access to the under pavement storage vaults at the front; kitchen with sash window to rear, white gas fired AGA, white kitchen units, stone flagged floor, space for fridge and dishwasher; wine store; store cupboard; utility with space for 2nd fridge, freezer, washing machine and tumble dryer. At the mezzanine level is a bathroom with twin basins, shower over bath, built-in storage. On the first floor are three further bedrooms, two with fireplaces and built-in wardrobes together with a shower room. Outside there is a patio adjacent to the house with lawned garden with shrubs and trees to borders including silver birch, 2 apples, pear, bay tree and a raised herb bed. To the back of the garden is a useful garden studio with power backing onto the former garage which is now a garden store but could be converted back into a garage if required.